It’s been a long time coming, but I’m happy to say that the laundry room makeover is finished. Yay!! The laundry room freaked me out when we first moved in. From the faux pebble floor, to the grimy cabinets and everything in between. But it got worse before it got better. Phase 1 of the laundry room makeover was demo, of course. (Find that post HERE) We got rid of the washer/dryer, tore out the floor and baseboard, and had the plumbing altered slightly. I installed cork flooring (but I wouldn’t do it again) and wallpaper for the first time (don’t ask!) and hubby swapped out the outlets and switches (post HERE). Then we bought our first set of front loaders — they were floor models of course! Things slowed down for a while until I decided to stack the washer and dryer, which led me to the idea to build a half wall with storage above. That really made all the difference! My tutorial on how to build the surround HERE. I love the storage above. These shelves are so deep I have to be careful what I put back there or it might get lost. See that coffee can with turquoise duct tape? We keep our lint in there. Yup. You heard me. We reuse our lint — it makes great fire starters for the fire pit in the backyard or for camping. You should start saving your lint… all the cool people are doing it. Next came the triple laundry basket shelf. Because I am limited on space in here, I could only fit a 2′ x 4′ counter top and I knew I would never have room to fold and sort all the laundry. The laundry basket shelves are perfect — I sort while I fold, then add the clothes to the appropriate basket. It’s also easy for other members of the family to grab their basket and bring it upstairs, theoretically. My tutorial for the laundry basket shelf is HERE. I never wrote a post on it, but I love the curtained area as well. I can fit two dirty clothes baskets back there, but I find I only need one. Right now I’ve got a ton of napkins stored under there because apparently I like buying napkins. You also get a peak at the plumbing lines. They were only shortened and new shutoffs installed. This way the counter top could go all the way to the wall. Yay. I LOVE the wall shelves! They are exactly what I always envisioned, but didn’t know exactly how to build. Well, I figured it out and it was really easy. You can read about it HERE. They are sturdy enough to hold my detergent and fabric softener and I never have to take them off the shelf to dispense. And no, it doesn’t make a mess because I stick the plastic cup in the washing machine after I dump the detergent in its little compartment. That teal container is an old tool box I bought at a yard sale last summer. It’s where I keep the mismatched socks until they find their mate. The WASH letters are those paper mache ones from JoAnn Fabric. I hung them with 3M strips, the ones that come as refills for their hooks, but you don’t have to buy the hooks. That post is HERE. The thing that held me up forever was trying to figure out how to hang clothes to dry, and finally last week I hung these paddles on the door. (Post HERE) They have been working perfectly. It’s the little things that get me excited. I never thought I’d have to worry about hanging out a cheerleading uniform to dry. But hey, the kid loves it. Have you seen the pictures on Instagram? They’re too cute. If I do say so myself. More easy DIY. The chevron fabric is from Hobby Lobby. Meanwhile on the other side of the room… Can you see the reason this already small room is so limited on space? Yeah, it’s because of the 3 doors. It usually looks like the picture above, with the hallway door open. I hang my disgusting ironing board behind the door. But don’t worry, I don’t actually iron clothes on it. I only use it for crafts. Haha. What about the iron, you ask? It’s in that tiny little closet, along with all of our beach towels, paper towels, tissues and back up laundry detergent. I thought about building proper shelves in there, but I figure, why bother? It works just fine the way it is. 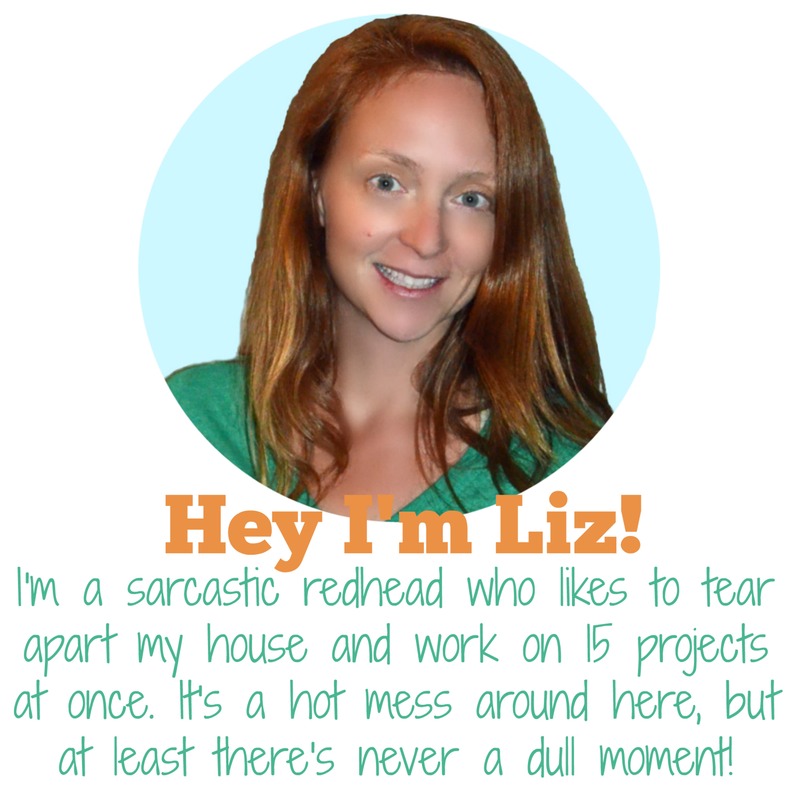 And girlfriend’s got like 50 other projects on her to do list. I can’t leave you with that image in your head, quick let me find a few more good ones. Oh, I keep instruction manuals and stuff like that in magazine files on the top shelf. These are those ubiquitous wooden ones from Ikea that I painted green. I organize them into 4 categories: kids, household, permanent (like the oven), and outdoor. The labels are Martha Stewart from Staples. I love her labels. I used them for my kitchen canisters too. This is the view when you come in from the garage. Which I don’t, because my car could never in a million years fit in there. That set of 3 frames used to hang above our bed in our last house. They told me they like it better in here. They dig the wallpaper. This is not one of those makeover stories where the room only stays this way for a hot second. No, this room is super functional and this is as bad as it ever gets. And once again… this is what it looked like during our walk-thru before we bought the house. 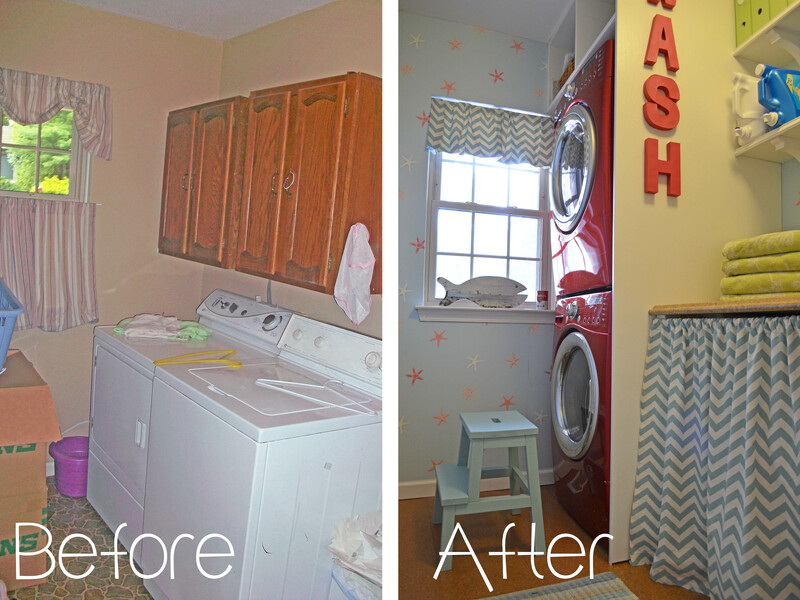 Be sure to pin this laundry room makeover for later! What a great looking laundry room – practical, cute, and a pleasure to do the laundry in. Thanks for sharing it via Anything Blue Friday. Have a great week. Thanks Kaye, practical and cute are what matter most right? And blue! This is so darling! I especially love the skirted folding counter. I am so envious of anyone with a proper laundry room! Thanks Rachel. I remember feeling so fortunate when we moved into this house. In our last house the washer/dryer were in the unfinished basement. I love being able to fold in here and not have to carry clean clothes all over the house. Thanks for stopping by! Wow, thanks Kim! I’m so glad you like it. That’s awesome. It sure came out super cute. I love a before and after photo they are so motivating. My laundry room is a blah blank slate. That is super amazing. Makes me think there is hope for my laundry room after all. It’s the very last thing that needs to be done in our old house remodel. Your laundry room looks fantastic and would be great for my small laundry room space. Do you like the washer and dryer stacked better than side by side? Mine are on pedestals and I’m not sure if I could go back to the washer being so low to the ground. Also, can you operate the washer and dryer at the same time if they’re stacked? So happy to have found your post from Life on Lakeshore Drives party! Hi Linda. I’m glad you found my blog. I love the washer and dryer stacked and yes I run them similtaneously all the time. They don’t wiggle or anything. I like that I can grab almost all the wet laundry out of the washer and heave it up to the dryer. It seems more efficient for some reason. I had them died by side for years bc I didn’t think I’d like them stacked but I find I like it a lot more this way. Good luck! Wow! What a great transformation!! Love how it turned out! I have laundry room envy right now! Thanks Emily! I will definitely do that. So many great ideas in one small room! Great makeover! It looks fantastic and you have tons of great usable space and ideas.